Senco took cordless nailers in a new direction when they introduced their Fusion line. Instead of using fuel cells or fly-wheels, Senco developed a recharging close-looped compressed nitrogen system that acts kind of like a mini air compressor built right into the gun. 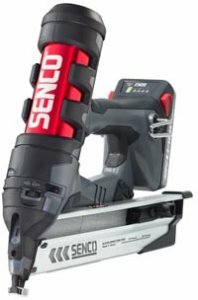 Senco initially released 15-gauge and 18-gauge versions of the nailer, and now they are expanding to include a 16-gauge straight nailer (F-16S), and a 16-gauge angled nailer F-16A. "We've had tremendous success converting pneumatic, battery, and gas-powered customers to the F-15 and the F-18," says Dave Moore, Senco's director of Fusion technology. "Now we have solutions for people who prefer a 16 gauge finish nailer." The 16-gauge models should be a nice addition to the line, and it do offer a few advantages. The nails leave a bit smaller hole compare to a 15-gauge, but I think the bigger advantage is the actual shape of 16-gauge nails. Because 16-gauge nails are square, they actually have more holding strength compared to round 15-gauge nails. Both F-16 model kits come with one 18 volt lithium-ion battery, a charger, and a canvas carrying case. A single battery charge can drive up to 500 nails, and their 18V battery can reach an 80% charge in only 15 minutes.